Jermaine Kearse grew up in Lakewood, attended Lakes High School and played football for the Lancers. As a senior he caught 54 passes for 903 yards and eight touchdowns. Kearse then attended the University of Washington and played for the Huskies. As a freshman in 2008, he played in all 12 games, with 20 receptions for 301 yards and two touchdowns. As a sophomore, Kearse led the team in receptions with 50; contributing 866 yards and 8 touchdowns. He was named a second-team All-Pac-10 selection. As a junior Kearse started all 13 games and again led the team in receptions with 63, for 1,005 yards and 12 touchdowns. He was named second team All-Pac-10 for a second consecutive year. As a senior he had 47 receptions for 699 yards and seven touchdowns. In April 2012, Kearse was signed by the Seahawks as an undrafted free agent. In the 2014 NFC Divisional playoff game against the Carolina Panthers, Kearse gained 63-yards with a one-handed catch in the second quarter. He caught two other passes in the game, each for 33 yards, to lead all receivers with 129 yards. 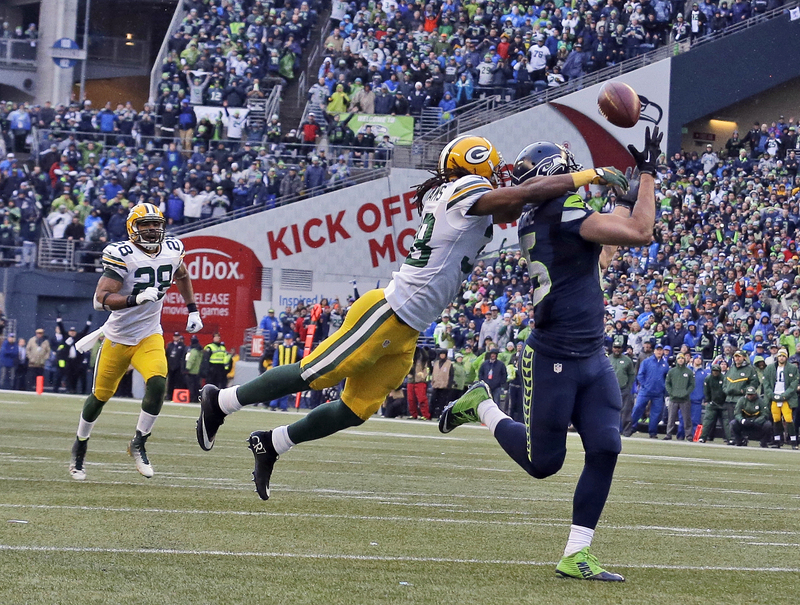 Seattle Seahawks’ Jermaine Kearse catches the game winning touchdown pass during overtime of the NFL football NFC Championship game against the Green Bay Packers Sunday, Jan. 18, 2015, in Seattle. The Seahawks won 28-22 to advance to Super Bowl XLIX. Source. Later in the NFC Championship Game versus the Green Bay Packers, Kearse caught a 35-yard game-winning overtime touchdown, to give Seattle a 28-22 win, after trailing 16-0 at halftime. It was the fourth straight postseason game in which Kearse caught a touchdown pass. The victory sent the Seahawks to the Super Bowl for a second consecutive year. It is incredibly rare in the NFL to be able to root for a hometown boy. Especially one who attended both a local high school and university. In this way, Jermaine Kearse was the quintessential Seahawk. Until nine days before the start of the current season, when he was sent to what most fans considered the worst team in the NFL. How do Seahawk fans, especially in Lakewood, accept such an utterly terrible decision by management? Still, ever the professional, Kearse has thrived with the NY Jets. With Kearse, the Jets have won three straight games for a 3-2 record (same as Seahawks). Kearse leads the Jets in receptions (22), receiving yards (220), and touchdown catches (3). In last Sunday’s win over the Cleveland Browns, Kearse had a 24-yard touchdown catch to seal the victory. Kearse is only 27 years old, so he could fit in with the Jets’ rebuilding efforts going forward. Many of us in Lakewood hope it works out for him. But what a loss for Seattle.